Seiche’s three-day PAM course provides the skills needed to become an offshore PAM operator. 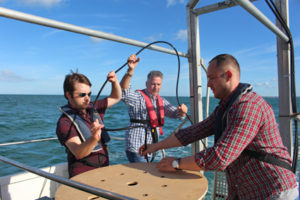 Run by our highly experienced team with thorough support material, interactive PAMGuard workshops and a boat session, this course will expand delegates’ knowledge of acoustic monitoring and provide insight into industry requirements for environmental mitigation. It provides the skills needed to use all equipment currently in the marketplace and is aimed at delegates with a scientific background, preferably in biology and marine sciences. A certificate for offshore work will be awarded upon successful completion of course. 5% student discount for one course on proof of full and valid student status. 10% student discount for two courses (when booking in conjunction with JNCC MMO or PSO course) on proof of full and valid student status. Our internationally-respected PAM Level 1 course combines classroom study with practical experience at sea to equip delegates with the all the skills required to become a professionally qualified Passive Acoustic Monitoring (PAM) Operator. Run by Seiche Training’s highly experienced team, delegates on this three-day course will acquire a thorough grounding in acoustic monitoring, an insight into industry requirements for environmental mitigation and learn how to use Seiche’s PAM equipment, which they are highly likely to use whilst working offshore, including PAMGuard software. The course starts in the classroom with a comprehensive look at the role of a PAM Operator and an in-depth introduction to PAM software, including an interactive PAMGuard workshop. On either the second or third day (weather dependant), delegates put the theory into practice by boarding a vessel and getting a real insight into how a PAM system operates whilst at sea. You will learn how to set the PAM system up whilst offshore, deployment in real-time and also, hopefully, get acoustic data from some real-time recordings. Detailed course support material provides continual reference. A certificate for offshore work will be awarded upon successful completion of this professional qualification. Lorenzo Scala has specific expertise in the installation, maintenance and deployment of acoustic hydrophone systems on seismic surveys and offshore piling and explosives decommissioning projects. 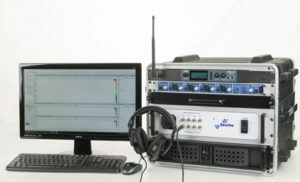 He also has experience in sound source verification (SSV) surveys. He holds a Masters in Marine & Fisheries Science from the University of Aberdeen. Stephanie Barnicoat spent several years working as a PAM operator using PAMGaurd and using various types of PAM systems. She is confident in the installation of equipment and deployments of acoustic hydrophones. Stephanie carries out a lot of data analysis for marine mammal detection using PAMGuard and Raven. She has a MSc in Biological Diversity from the University of Plymouth. After completing the Level 1 Passive Acoustic Monitoring (PAM) course, delegates are often keen to extend their knowledge. Seiche now offers a PAM Level 2 course which will equip delegates with experience in data analysis, troubleshooting and will deliver more expertise in configuring PAMGuard.